What desires do revolutionary women nurture? Are political actions and commitments of women political actors ‘driven by their romantic desires’? Did revolutionary women find a fulfillment of their ‘personal and political desires’ in the Communist Party of India (CPI)? Can their desires at all be separated from the political worlds that they inhabit or were they uniquely integrated? In the romanticized accounts of revolutionary women, what about the psychological and material price that the women pay? Was there an element of ‘rendering revolutionary passions monstrous but redeeming the women who espoused them’ (p. 68)? How does a conservative social identity reside with a radical political one, which defies any boxing of revolutionaries, including revolutionary women? What have attitudes to domesticity, parenthood, motherhood, conjugality, friendship, marriage, renunciation, sexuality and the family, been in the Communist Party of India (CPI) or other Left-Wing groups or anti-colonial groups? Did the CPI advocate free love, or did it develop a systematic critique of dominant sexual mores, or did it integrate a critique within its programme? Do Communists reinforce the delineation of the personal and political worlds by ‘endorsing a bourgeois division of the individual and the collective when saying it is bourgeois to pay attention to the personal?’ These are but some of the questions that one gets to probe as one reads Revolutionary Desires. Is it not a contradiction to be a Communist and a nationalist? But were not Indian Communists talking the language of nationalism? Why does some of it seem hardly different from the dominant Hindutva nationalist articulations today? Could it be because Communism ‘cements asceticism, discipline, chivalry, authoritarianism, and Aryanism’ as characteristics of the heroic revolutionary? Could it be because Communist praxis has been a mixture of radicalism and prudishness? Wasn’t there a kind of unwritten Party line about love and marriage for the sake of the Communist revolution (read nation) in the Indian context? Would it be correct to say that masculinity, the Indian nation and a Hindu lineage were interwoven in the formation of and political awakening of a revolutionary? If there is one abiding feature that one gathers from the book, it is that the Left Wing groups’ positioning is not static but dynamic. Revolutionary Desires is impressive for the sheer volume of reading and research that it draws upon and which is a labour of years of reflection and digestion. From grappling with the contradictions of her own growing-up experiences that were not consistent with convention and manifested ‘that particular quality of being at once supportive of and detached from us, radical in their attitudes to gender and yet curiously puritan’ (p.4), to ‘exploring the routine experiences of revolutionary women of different class and regional backgrounds with a view to understanding the place of gender in the culture of Communism (and indeed the place of Communism in the cultures of feminism) in India’ (p. 3).The book, in a sense, seems to invoke both Communist and feminist historians to sit up and listen to a different drum, of recounting history as it were. A running thread in the entire book is the contradictions that the author has experienced and then found affirmation in, in referred genres, ranging from autobiographies and memoirs, fragmentary accounts to anecdotes, to even such documents as a confessional statement made by the revolutionary Bina Das after she shot the Bengal Governor on 6 February 1932, to interviews to party periodicals, pamphlets and documents, newspaper articles to novels and other literary texts, are, in fact, the running thread in the entire book. The author probes into what the various texts are saying, selectively saying, not saying, and deliberately hiding. In interviewing women revolutionaries, the author has not confined herself to interviewing celebrity Marxist women alone. Occasionally, the author also refers to texts from researchers and revolutionary women of other nationalities around the theme, and draws some parallels and differences; and some inspiration too, as when she quotes Portelli to say, ‘Our research may help us cope with some of our most pressing contemporary needs, the redefinition of ‘self’ and the crisis of political action’ (p. 31). The first chapter, ‘The Romance of Revolution’ looks at Bengali literary texts such as Sarat Chandra Chatterjee’s Pather Dabi (Right of Way) and Rabindranath Tagore’s Char Adhyay (Four Chapters) that were the staple of young rebellious Bengali women that fuelled certain imaginaries about revolutionary men and women and did not reinforce the normal of women prioritizing what is called the ‘larger cause’ to the ‘more varied’. It also juxtaposes them with ‘nuanced subjectivities’ that the ‘own stories and voices’ (p. 51) of some Bengali revolutionary women manifested. For instance, the revolutionary hero Sabyasachi in Pather Dabi is this invincible, omniscient and there-is-nothing-he-cannot-do hero. This is particularly important to see, given the expectations of revolutionaries, particularly of revolutionary women, ‘to do “real” politics instead of wasting time in this nach-gana (dancing and singing)’ (p. 7), treating the personal as an unwelcome diversion from the struggles that really mattered, disowning feminism by reducing it to a fight directed against men, berating feminism as ‘being idealistic and not practical’. In the chapter ‘Love in the Time of Revolution’, Loomba frames the various representations of an ‘episode’ and indicates how these very representations ‘illuminate the webbed relations between sexual and revolutionary politics, both within militant organizations and in public culture at large’ (p.76). Be it the representations in Hindustan Socialist Republican Army (HSRA) leader Yashpal’s novel Dada Kamred (Brother Comrade) or Yashpal’s autobiography Simhavalokan (A Lion’s Eye-View), or revolutionary Prakashvati Pal’s own version through her interviews and in her 1994 memoir Lahore Se Lucknow Tak, or various oral or written testimonies of other HSRA comrades, or other representations. 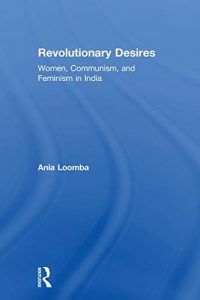 Probing into quenched/unquenched desires of revolutionaries in communes and selective acceptance of their beliefs, is what the chapter ‘Commune-ism’ sets out to do, by discussing various texts including the occasional book about the Bombay Commune or MN Roy’s critique of gender asymmetry and sexual mores in India and of Gandhi’s asceticism and ‘creed of sexless marriages’ to Alexandra Kollontai’s memoirs and her short stories from The Love of Worker Bees. The discussions around the respective autobiographies Pan Aikta Kaun (But Who Listens?) and Eka Ranaraginichi Hakikata (The Story of a Female Fighter’s Life) of two of Girni Kamgar Union’s leaders and organizers Ushabai Dange and Parvatibai Bhore who ‘detail the cross-hatching of their intimacies—love, cohabitation, child rearing and familial relations—with their political consciousness and the class dynamics within the trade unions and Communist Party’ (p. 156), are the centerpiece of the chapter ‘The Political is Personal’. ‘The Dance of Hunger’ foregrounds the leadership role of Communist women in relief efforts during the Bengal famine, whose work ‘catalysed the formation of a new kind of women’s political organization—one which moved beyond the ambit of existing nationalist women’s organizations, and simultaneously pushed the Communist Party to engage with women’s political activities’(p. 195).The narrations of four women whole-timers Vimla Dang from Punjab, Murtazai Shakeel from Hyderabad, Kondapalli Koteswaramma from Telangana and Usha Dutta Verma from Bengal, who were all married to other whole-timers, of ‘their experience of communist and biological families, coupledom, party life and old age’ pave the way to understanding ‘The Family Romance’. Putting the spotlight on the intersectional, political and social world that went into the making of Sheila Didi, a Communist Party and women’s activist with the Punjab Istri Sabha, a branch of the National Federation of Indian Women, and a lawyer, is the forte of the chapter ‘Becoming Indian’. It is a commentary on how Sheila Didi straddled the world of struggles for racial equality in Kenya with the world of struggles for Indian Independence and leads to an understanding of ‘how the history of radical organizing was also a history of inter-racial collaboration’ and ‘the place of women within this story’. It seems that these were perhaps the initial rumblings of the connections between racism (as reflected through caste), capitalism and sexism in India. The author notes through Sheila Didi’s story that ‘these histories are redemptive but differently so, especially in a time of the escalating racism towards Africans in India’ (p. 299). In that sense, the book is not just a lament about the secondary role of women, but a recounting of a vivid engagement with Communism and the envisioning of the revolution. In ‘By Way of a Conclusion’, the author shares, ‘I have tried to show how gender relations were the prisms that refracted the entire spectrum of radical and Communist women’s activities in India’ (p. 304), which included both ‘underground or militant actions against the colonial as well as the bourgeois state, strike actions and economic mobilizations, the formation of women’s organizations, and cultural activism’ and ‘attempts to reshape domestic partnerships and personal friendships while reimagining political collectivities’ (p. 305), even as CPI women (including the author’s own mother Primla Loomba quoted in the book) chose to set their Communist fight apart from the feminist movement. The book is indeed amazing for the diversity it handles, the many postulates it lays bare. The agency of women revolutionaries is also reflected in their ‘range of negotiations with dominant assumptions about ideal femininity’ (p. 37). The negotiations were intended to ensure that they in particular and women in general have a voice. The author argues that ‘literature and history are mutually constitutive modes of representation and hence that what matters is not the nature of materials but rather our reading practices’ (p. 39). ‘Had they read the novel as an accurate map of their own possibilities, they might have felt less than inspired by its roadmap of women’s activism, but the sheer representation of female revolutionaries proved enabling’ (p. 50). In a later chapter titled ‘Becoming Indian’, the author draws attention to the subjectivity or partiality of any source. Loomba remarks that, ‘When people reflect on their lives, they are not only selecting from the past, but they can also forget, lie, get confused, make mistakes or exaggerate. Nevertheless, as commentators have pointed out, “they are revealing truths” even though “truths of the personal narrative are neither open to proof nor self-evident. We come to understand them only through interpretations, paying careful attention to the contexts that shape their creation and to the world views that inform them”’ (p. 280). The distinction in the narratives across class and the nature of location can also be distilled from the various quotes. It seems, at first, when one begins with the introduction, that the usual prevailing stereotype of Communist women being so obsessed with ideology and macro-politics that they don’t intervene at a personal micro-political level, is being busted. However, as one forays into the book, one finds constant shifts from micro-interventions to macro-interventions on the part of Communist women and in fact a spectrum of other kinds of interventions in between and beyond. At the very start, the book recognizes the fraught relationship between the Communist movement and the women’s movement the world over, but commendably marks the distinction and particularity to each social and cultural ethos. The book, however, falls into the trap of claiming, by its title specially, to speak of a pan-Indian Communist ethos, even as it recognizes regional/State (province) specificities, while essentially covering North India’s Punjab and the United Provinces, and Delhi, and at best the mid-West Andhra and Maharashtra. This does not imply that it takes away from the almost Herculean task undertaken by the author. The book jogs historical memory while covering revolutionaries during the period/s from the early 1920s to the 1950s. While it is intended to put the spotlight on Women, Communism and Feminism in India during the period, it does cover revolutionaries who were not Communists as well and embarks on the delicate task of distinguishing terrorists from Communists, even as it points out that when it came to women, the projected glamour of derring-do coincided. It also draws attention to the pervasiveness of patriarchal norms such that gendered relations in the family were even replicated in the commune which was meant to break away from dominant norms. Sometimes the stereotypes and clichés are smashed or transcended and sometimes they are confirmed, and hence what constitute revolutionary desires cannot be classified in neat binaries, but are spread over a spectrum. The author brings out the yawning gap between progressive goals and conservative realities with quotes from interviews conducted by the author with various women revolutionaries, as also from memoirs and autobiographies written by them. The author has had the distinct advantage of some familiarity with the women she is speaking to and the benefit of being accompanied by her mother who was herself a Communist, who sought to distinguish herself from a feminist. The book is certainly a niche book—in the league of significant deeply-researched histories which facilitate an understanding of the location of revolutionaries in the first half of the twentieth century in India, to enable a view of the continuum with today’s politics and thus to create a space that would allow for the emergence of a revolutionary politics that will shape a ‘new female—and in some cases feminist-political subject in India, in collaboration and contestation with Indian nationalist, liberal feminist and European left-wing models of womanhood’ (p. 4). Albertina Almeida is a lawyer, human rights activist, independent researcher, and a contributory teacher teaching Gender, Human Rights and Law at Goa University, MA (Women’s Studies).